Matt and I love shrimp. And cooked pineapple. And salads. And Rocky Mountain Sriracha! 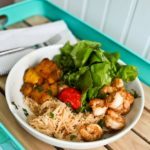 So on a weeknight when we had the ingredients on hand, we created this shrimp bowl that was too fun to not write down. We started with lettuce from the garden. This was part of ‘salad week’ where every night we had a big salad topped with something fun in an effort to use up the greens flourishing in the garden beds. Hi Mr. Pineapple! So juicy sweeeeeeet. The method for the shrimp and pineapple were simple: sear, dump in some sauce, remove from pan, repeat. The pineapple soaked up the sauce so that every bite was sweet/savory delight. The stars of this bowl are shrimp and pineapple - both cooked and dressed in a bright sesame sauce. 1.5 cups fresh pineapple can be canned if you want but fresh is best! Prepare sauce by shaking together ingredients in a jar. This will be your glaze, dressing and finishing sauce. 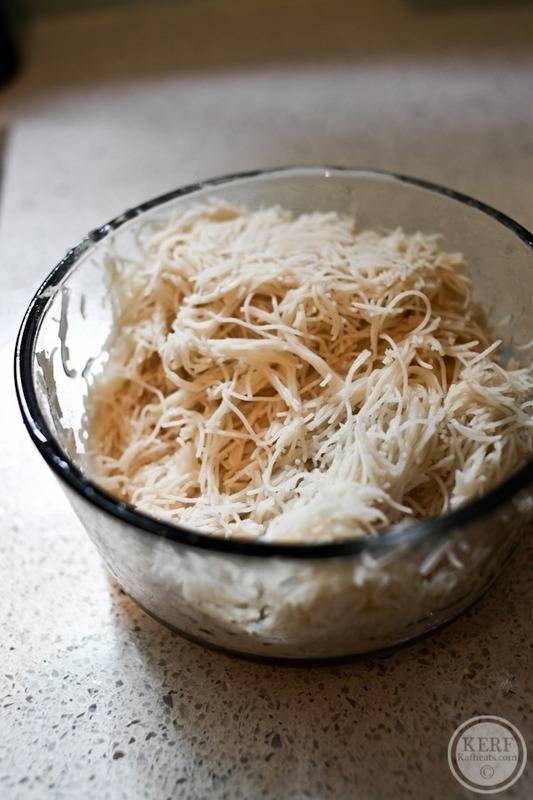 If needed, set a pot of water to boil for the rice noodles and cook as directed. Meanwhile, heat a large pan to medium high and add sesame oil. Add shrimp and cook for a few minutes per side, until they brown and turn pink. Resist the urge to crowd the pan! When shrimp are almost done, add 1 tablespoon of your sauce, toss to coat the shrimp and remove them from the pan. Add pineapple cubes to the pan and toss them in the brown bits that remain in your pan. 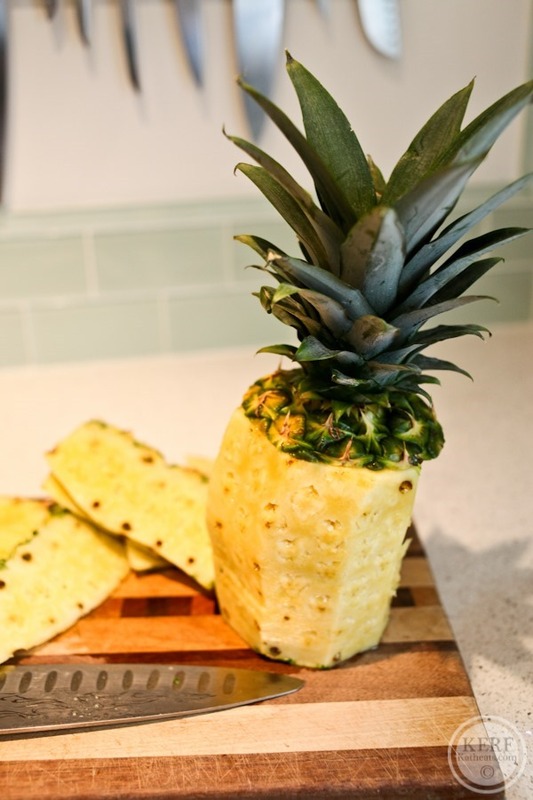 Cook pineapple until it begins to brown and soften and then add another tablespoon of the sauce. Remove from pan. 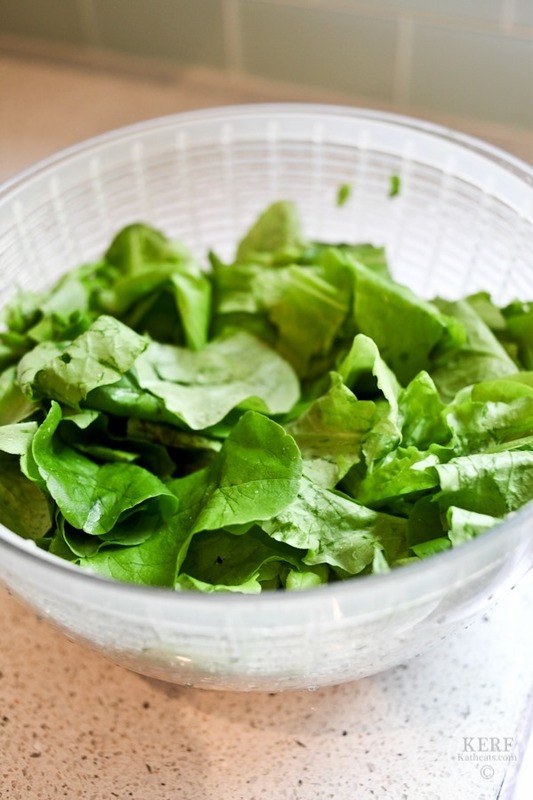 Toss lettuce in 2 tablespoons of sauce/dressing and toss noodles separately in another 2 tablespoons. 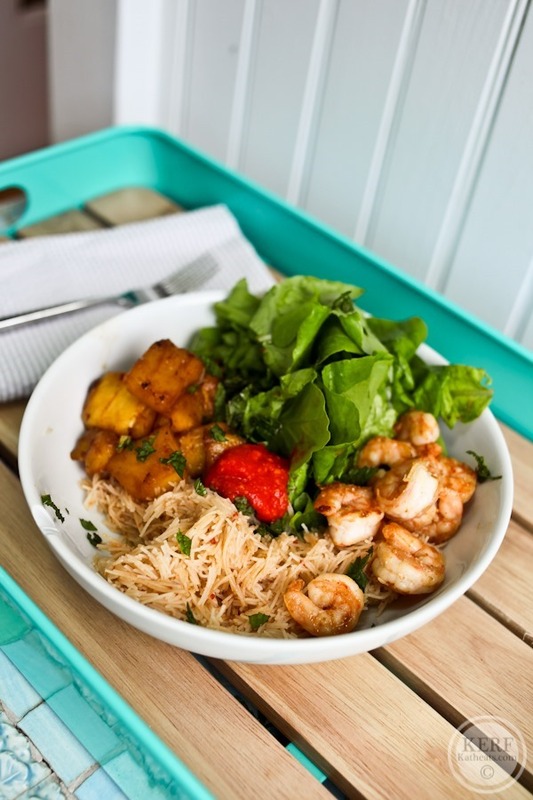 Fill bowls with sections of lettuce, shrimp, pineapple and noodles. Drizzle on any remaining sauce. Garnish with chopped mint, fresh lime juice and more sriracha. Eggs and prawns are the two things I miss most since going vegan! This looks delicious! I know Emily! I have contemplated going vegan so many times….but I would miss eggs (& cheese) so much I just can’t do it. 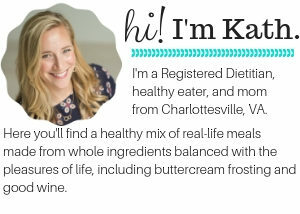 I do make meatless meals and eat a mainly veggie diet…..to my husbands dismay! HA! Definitely making this! I’m yet to cook shrimp and I’m so afraid of over cooking them! How long total did those size ones take to cook? I’m obsessed with sriracha, I’ll have to check out the Rocky Mountain Sriracha. Do you have Asian markets in your area? 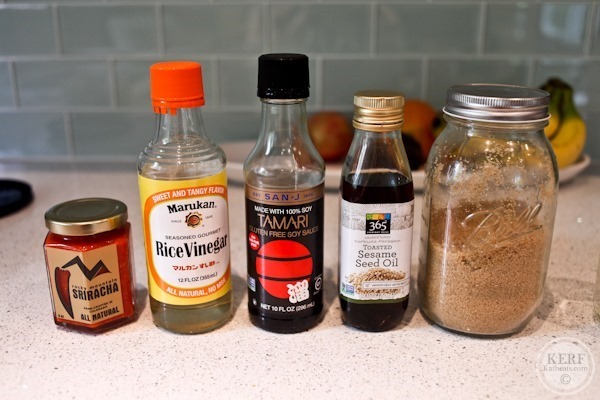 I’ve found that the sesame oil in those grocery stores are a million times better than anything you can get in a regular grocery store. This looks delish. That salad look delicious!! 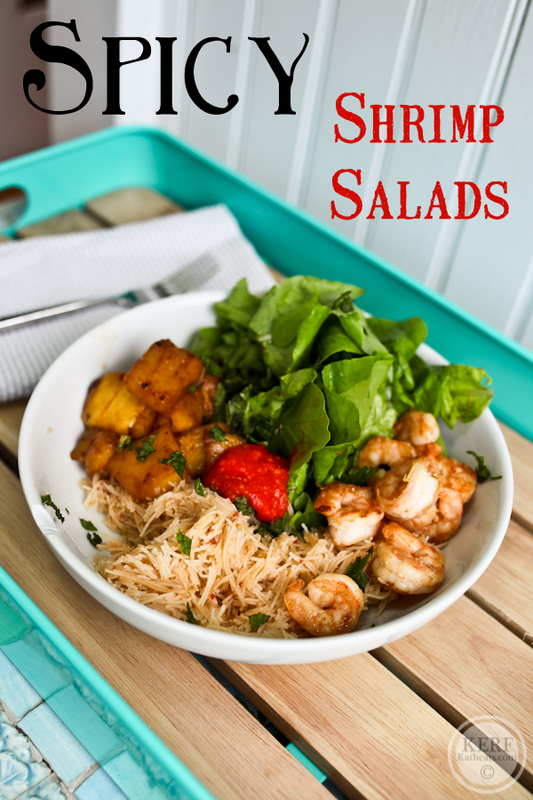 I love the idea of shrimp and pineapple together, so summery and light! 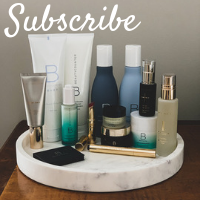 I actually made this over the weekend thanks to it showing up in my Feedly early for some reason! It was a little too sweet for me, but I just added a little more soy and sriracha to cut the sugary-sweetness of it and it was good!! This looks so delicious! I have most of the ingredients but will pick up the rest tomorrow for our dinner. Even though there’s not a great vegan/vegetarian substitute for seafood, I think these flavors would work beautifully with tofu so I’m definitely going to try it! Mmmm, this is right up my alley! I love grilled pineapple. I made this recipe tonight and we loved loved loved it. Such a great combination of flavors. Thanks so much.